MK Yehuda Glick meets with representatives of both sides following riots, says secular Jews and haredim have real desire for dialogue. MK Yehuda Glick (Likud) visited the city of Arad Sunday following the riots which rocked the city last (Saturday) night, when a protest against the Gur hassidic sect deteriorated into a mass brawl between the two sides. A secular resident was attacked after hanging an anti-Gur poster reading 'Alter and Litzman, Arad is not for sale.' Alter is the Gur grand Rabbi, and Litzman is Israel's Health Minister and a member of the Gur sect. 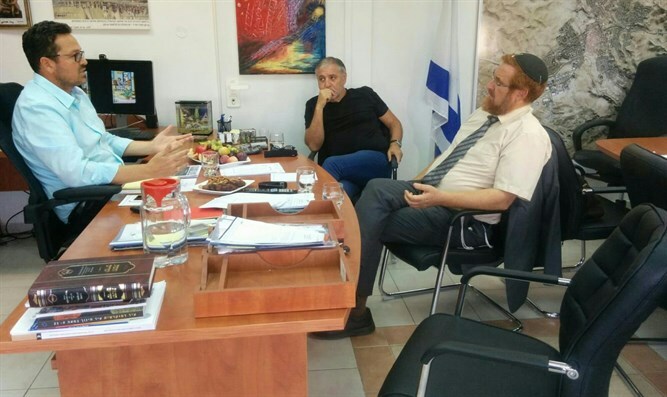 MK Glick met with the mayor and all the parties involved in the clashes in order to reach an understanding and foster dialogue between the two sides. Glick noted, "I saw what happened here yesterday and it hurt me a lot. I canceled my daily routine and came here to listen. I sat with the mayor, with a member of the city council who represents the Gur hassidim. I met with Gur hassidim and with the family who hung the sign. We will begin the new year in another two weeks, and we cannot enter the new year with the fires of controversy still in the air." "I heard a lot of pain here. On the one hand the mayor has lowered the municipality's huge deficit. On the other hand there is a lot of anger directed at hi from different directions. The community here feels threatened, There was a lot of pain here, and the problem is that everyone is correct in their pain. What they need is to channel that pain," Glick said. "We sat here with the Gur hassidim who disapproved of what happened here yesterday. I heard the family which hung the poster, and [the wife] said that she did not understand just how offensive the poster was. I believe that everyone wants to return to normalcy, to the peace that has existed in Arad for all these years," he added. "When people understand the importance of dialogue, even when the gaps are large, they can be solved. But when people have an interest in increasing hatred and conflict, then they will find a way to fight even when the gaps are small. "I have found here a genuine desire from people on all sides for dialogue and calm for the benefit of everyone ... I am convinced that if people were sitting face to face with each other, the approach would be different. That's how it will be here," Glick stressed.